This Plugin allows store customers to review their order status without having to register as a WordPress User prior to Checkout. Looking for support, a copy of the readme, Plugin updates, Ideas or usage instructions? 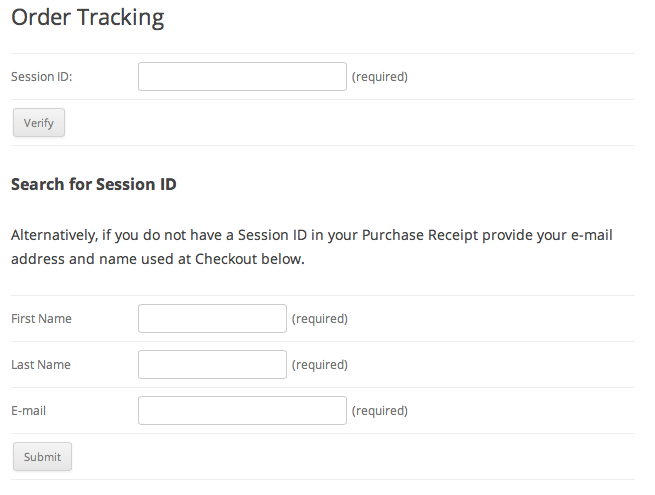 Check out our Documentation for Order Tracking Pack. Found a shortcode compatibility bug. Seems that the absence of ob_start() in wpsc_ot_replace_user_page() can interfere with any other shortcode coming before [order-tracking] in a template. This results in the output of the previous shortcode being echoed before the page’s tag. In my case I’m trying to place the order-tracking template side by side with an account login template (using theme-my-login) so all customer verification/login happens on the same page. Placing ob_start() on line 104 solves the issue for the order tracking template, haven’t yet tested the lookup and verify templates. Hi niall, thanks for raising this, I’m looking at this change now and will include it in a minor Plugin update. I notice the order date is wrong. The WordPress clock is correct but when viewing orders it is off by several hours. Am I doing something wrong? thanks. Hello. I have a client whose product requires some customization before it is shipped out. He does NOT want to sell products on his website (not yet), but he DOES want his customers to be able to login and track the status of their orders. He would, essentially, like to enter the order information into the back end, and have the customer receive an email with the order and tracking information. Is this kind of thing possible with your plugin? 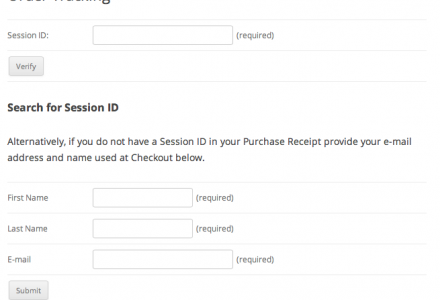 Hi Chris, your client can use Manual Ordering to generate Orders in the back-end via the WordPress Administration and share the Session ID with the customer so they can see the status of their Order. Does this just let the customer to see the status like – shipped or Pending, or does it show things like shipping tracking numbers and shipping method ? It shows the status along with your custom message. If you have shipping data it will display the carrier and the tracking number. Do I need a e-commerce plugin to use in order to use the plugin? I have the most up to date version and I found a bug. When someone looks up their session ID by entering there first name and last name and email address – if the order is closed it will not find the session id. Comes up as no session found. Do I need to get the update directly on your site? Or will it flow within wp-admin in the updates tab? I just noticed the version you have here is 1.2.9 and I am running 1.2.8 so does 1.2.9 fix the issue? There are no screenshots or further details on how this plugin actually works or looks. 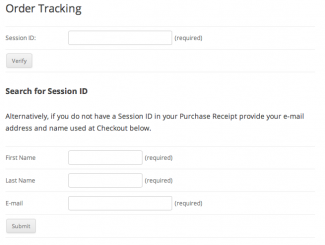 How does this plugin enable users to track their purchases through the WPEC store. Is it through the user’s profile page in WPEC? I would be interested in this plugin if there were more information. Order Tracking comes with a Quick Start document (readme.txt) to help with installing the Plugin. Additional support can be found from the Contact page or methods below. If you have any problems, questions or suggestions please join the members discussion on our Order Tracking forum. 3.1. Create a new Page including the following shortcode within the Page content to enable Order Tracking on that Page.